If you want to be the best neighbor on the block, you should own a voltmeter. 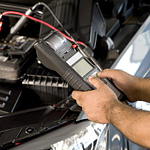 It's the simplest means of telling if a vehicle battery is weak. Remove the black battery terminal FIRST. The reading should show your battery is 12.3 or higher. Anything at 12.2 (50%) or lower means your battery is failing. It's time to have a new battery installed. Let your neighbors know you perform this free service and watch how popular you become. If you'd like to have your battery replaced (or send your neighbor this way), visit us at Hanna Imports and we'll take care of any vehicle need.